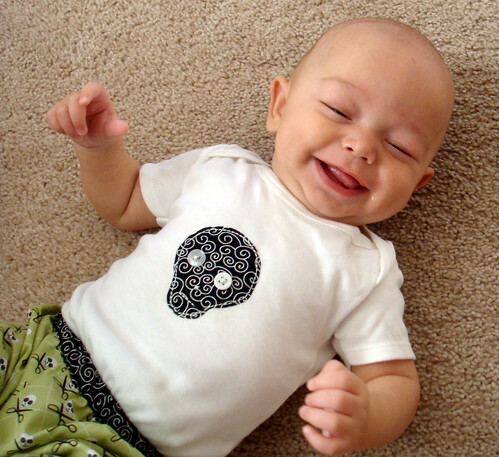 A little sewing for baby. I finally decided to see if I could sew a pair of shorts for R. C. and I had seen a picture of a cute pair in a magazine and realized that I could probably make similar ones. R. is skinny so all his shorts and pants fall off, with the exception of the pair of shorts I used to make this pattern. If the poor boy is going to have anything to wear I'm either going to have to take in the bottoms he has or make some ... so why not try to make some? A. and C. picked the fabric, I believe it's a Michael Miller print, after vetoing most of the prints I suggested (apparantly they were all too girly ... sigh ... ). C. thinks I shouldn't use prints, just stripes and shirting fabrics. While I like her suggestion, I really think it's just too bad she's not the one doing the sewing (though I will do some stripes and shirting fabrics too ... and will avoid florals). I traced a pair of long shorts that we already had and went with that. That was awfully easy! I can't believe I thought I'd screw it up terribly. I did make the rise too short, so I had to add the black band at the waist. The rise is still a little too short so I'll add to the pattern next time. I had to make a matching shirt, mostly because I didn't have anything for him to wear with the shorts. Total time to create the outfit ... less than one hour. I love those!! 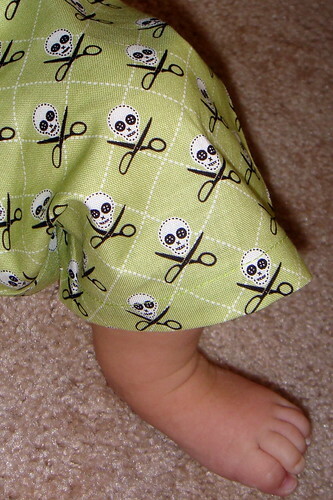 I have always made capri type pants for Dex...pants as a baby that turn into capris for a toddler. bonus!! and yes, they are so easy! Wonderful job on the new outfit! I love making shorts for the little ones. So simple. So cute! I have the same problem with 2 of my little ones - nothing stays on they are so skinny. May I make a suggestion... Look for the sandbox pants pattern by Oliver+S for long pants. They worked great for my little one and for winter I lined them and they were super warm. I still consider myself a beginner sewer since I usually have a problem following patterns but this one was very easy and quick. how cute is that outfit!! great idea for a infant I know! thanks!